Only this time a new partner in crime will accompany you: your under-one-year-old baby. Introducing your child to the grand world is a great privilege. While I believe that nearly any destination is suitable for a baby — given the right attitude from you as the parent — setting off on your first trip with baby can be daunting. Similar to your first trip, there are some nerves involved. It’s hard to know what to expect with baby + travel. You can stack the odds in your favor by picking a baby-friendly destination for your first trip. Leave the stroller at home for this city. Thanks to its extensive public transportation system and walkable neighborhoods, you can visit every tourist attraction, cute local pub, or wander at will through the historic cobblestone streets. And you won’t have trouble finding restaurants open at odd hours if your schedule gets thrown off and you’re hunting for dinner at 11pm. Opt for a baby carrier for easy sightseeing, letting baby snooze comfortably close to mom or dad. Plus, Boston doesn’t get super hot so no concern about baby getting overheated. Enjoy utter freedom to set your own agenda or skip the sites that baby will scream through (like an art museum). With this trip, book an Airbnb apartment for more privacy and create a familiar setting for a home away from home. Fort Warren in Boston Harbor: reachable by nap-inducing ferry, this 28 acre historic fort on Georges Island is prime opportunity for exploration. Or letting your just-learned-to-walk child run off some steam on yards of open green grass. After a scenic two-hour drive from Denver, you’ll find majestic Rocky Mountain National Park. With its snow-capped mountains and lush green valleys, I dare you to keep your rental car on the road. If baby is happiest in the car, pick this destination. You’ll spend pleasant hours in the car spotting elk and longhorn sheep herds. Or pack a picnic lunch, pinpoint a hiking trail, and hit the dirt to enjoy some mile-high hiking with snoozing baby strapped to your chest. Book a cabin or an Airbnb rental in nearby Estes Park. Imagine a fully-inclusive beach resort with a vacation nanny who is trained in CPR and assigned to only you from 9am until 4:40pm. While I’m not a traveler that’s inclined towards resorts (not enough choose-your-own-adventure), this option is attractive. Your food, drink and room are included in the final price. But with this family resort, you can sneak away for Mom and Dad only time while leaving baby in your vacation nanny’s capable hands. 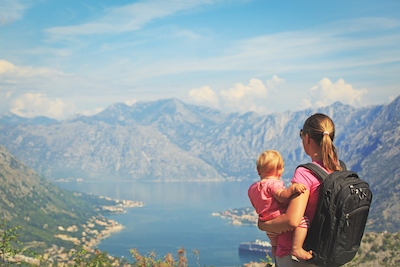 This baby-friendly destination is a great introduction to traveling with baby. You can marry your pre-baby traveling habits with new post-baby experiments, so you can figure out what works and what doesn’t in traveling with your baby. Rocky cliffs plunge dramatically into pounding surf. Trees crowd the strip of sand. Sea lions march ponderously into caves. Welcome to the Oregon Coast: a place where you can get to know your little one’s travel spirit amidst the crashing surf and freedom to drive miles along a curving coastline. Here you can set your own schedule. The usually cooler weather is perfect for long walks with baby snuggled against your chest. Or forgo outside activities and relax inside with baby, catching up on sleep. That’s the beauty of the Oregon Coast with an infant younger than 1 year old: explore as much as you desire or enjoy the views from your rented house. Newport: 2.5 hours from Portland, fishing village turned tourist stop with cute stores lining the main street. Sea lion caves are a short drive away. or hang out and grab a beer at Rogue Brewery’s outside picnic tables. Think this option is rather broad? That’s the beauty of it. Sometimes there’s a destination that’s been calling to you. A place or city that you can’t get out of your head or you keep hearing about. I bet it just popped into your mind. What baby-friendly destinations have you taken your baby to? Laura Lopuch is a copywriter and incurable traveler. She blogs at Waiting To Be Read where she helps you find your next great book to read because life’s too short to read crummy books.